Life of Pi by Yann Martel is one of the most analysed, discussed and debated books of recent years, not just because of its plot, but because it makes the reader question what they have read and what they believe. The Booker Prize winner author was one of the major draw cards at last weekend’s Brisbane Writer’s Festival, and he didn’t disappoint. He spoke about his motivation for writing Life of Pi, and how researching the story changed his life along the way. In this post, I’m going to share a few of the things he spoke about. 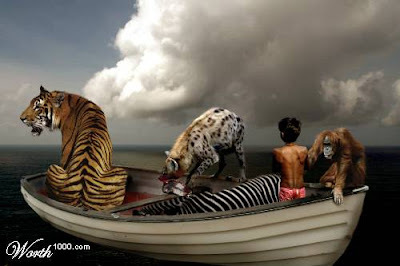 Those who haven’t read Life of Pi – and intend to – may want to look away now. Don’t spoil the experience of discovering the book’s talking points for yourself. Life of Pi provides the kind of literary experience fans tend hold close to their hearts. Yann understands that, and opened his talk by promising to try and do “the least damage” to individual interpretation of the story. Because the interpretation of this story is everything. The tale begins with Pi, the son of a zookeeper in India, who becomes curious about religion and simultaneously practices Hinduism, Islam and Christianity, much to the consternation of his respective religious teachers. Pi’s religious instruction is interrupted when his family decides to relocate – along with a large menagerie of animals – to Canada. Tragically, the ship sinks during a storm. What follows is a fascinating, perplexing and occasionally disturbing story of survival. When Pi finally washes up on the shores of Mexico 227 days later, he recounts two versions of his story. The same facts are offered, with a different interpretation. In the first, Pi is the sole human survivor on a life boat with a zebra, hyena, orangutan and a huge Bengal tiger called Mr Parker. The second has no animals and is far more brutal. One requires suspension of disbelief, the other is “reasonable”. Yann said the very structure of the story itself is designed to force the reader to subconsciously choose whether they are prepared to walk away from the “reasonable” to accept the better story. In other words to have faith, when to do so makes no sense. The background to how the novel came about is interesting in itself, but this post is more concerned with the story what makes it such an original piece of narrative fiction. The key for Yann was the question posed by Pi at the end of the book to the Japanese shipwreck investigators: which is the better story? For the author, this is the question at the heart of choosing a life of faith. To find the answer, he put aside the aspects of religion that repel him and went to India’s diverse holy places “pretending” to have faith. He candidly admits that once inside that space, he didn’t want to leave. Life of Pi was his personal protest to stop making sense. To believe in a reality beyond the chemical. One of the great moments of the session on the weekend was Yann’s explanation of the purpose of “the island”, one of the more obtuse plot developments in modern literature. He said it served the sole purpose of making the “animal” version of the story harder and harder to believe. Even more so than the chance of a blind boy and blind tiger, coming across another blind shipwreck survivor, it’s at the point of the island that disbelief breaks down and the reader wants rationality kicks in. But in his own words “religion goes beyond the confines of the reasonable”. For him, life is a matter of subjective interpretation of objective reality. Ultimately, Yann presents a very post modernistic perspective (all stories have equal validity – there is no ultimate truth, only what you believe). Having said that, the author admits that after looking at all major religions, he’s become “pretty comfortable with Jesus”, although it’s safe to say he is not a member of any organised religion. Regardless of whether you share his views on religion or philosophy, there’s no denying Life of Pi is an amazing use of narrative structure to encourage readers to think beyond the story – to even question what they believe and why. This is an awesome blog about a fascinating book. You've done well Westie. I really like the book. its definitely worth a look. I plan to read Life of Pi eventually, so I only skimmed your post. I'll make a note to come back to this once I have actually read the book. I like the idea of a story that will make me quest what I have read and what I believe. Another well written and interesting post on a fascinating book. This story is making waves and although I have not read it yet, your post makes me yearn to get my hands on it. Great post! I love that photo. I always wondered what the point of the island was. It just seemed like it came out of nowhere and was so strange. I really loved this book. I loved the book! I didn't understand all of it so was happy to read your post today. It helped me to put some things into perspective. I read the Life of Pi a few years ago and remember that it puzzled me. Your post has made me think I'll re-read it and see if it is any clearer now. Just finished it today--I'm glad I didn't spend a lot more energy trying to figure out the symbology of the island! Thanks, that helped me make sense of a book that left me a tad baffled. I guess I'm the "reasonable" person as well but I can understand preferring not to believe the story of human brutality. A very interesting interpretation which I was craving after finishing it. I just finished reading the book and was a bit confused by the ending and just googled 'life of pie ending explanation' and found you! Thanks so much for the post, I totally get it and understand the deeper meaning for it as well, thanks so much! The author was spot on with his choice in the end of Jesus as well, Jesus is love! Thank you for this post! I finished the book today and was extremely confused and uncomfortable about the ending. After reading your post I understood that it didn't matter what story was 'right', that is not the purpose of the novel, but for the readers to decide for theirselves and question their own beliefs. Fantastic book. Thanks Kenna. It's definitely a different way to perceive a story, but that's what makes this book so fascinating and memorable. Glad the post helped! I saw the movie yesterday and was confused at the end as well, I didn't read the book but I'm planning on it. from what I heard the movie much better than the book! with the visual effects that they used. but difentely your blog make more sence now to me. I saw this movie last night. I thought the ending was the point of the whole movie. He said near the beginning that the writer would, by the end of his story, believe in god. At the end of telling of the two versions of the story, one with the tiger, fantastical and the other realistic and full of real emotion. He asked both the Japanese investigators and the writer, "which do you like better." They all chose the tiger story because they liked it better. And then he says "and so it is with God". Meaning we chose the god stories from all of these religions because we like them better than reality. In other words god is delusion but its more pleasing than reality, in this case great loss and canabilism. He ate the cook. To me, the entire movie and book Life of PI is a parable that does not have to hold any meaning to somebody while it may hold meaning to someone else. Regarding the nature of the story, I choose to summarize it as PI got stranded on a boat. He was there alone, with a couple of animals, and had to survive a long time out on the water all by himself. He therefore exaggerated events, to suit the nature of the voyage he was on. There really was a tiger, but not a magical fish. The Zebra really did get killed but there was not a hyena since no hyena bones were on board. The tiger ate the Zebra out of necessity. The mythical so called Island really did occur, but not in the way we were told it occurs. Due to his calling out to God/Creator, he did land on an Island. It was not a giant plant Island that could grow like a tree. I surmise it was this Island, which history has found ample evidence of that exists in the South Pacific region. El Banoor, is a mud Island Atoll that does exist in the South Pacific region and has been encountered on several occasions. It is out the way of Madagascar. El Banoor does hold life, such as an exotic plant, Meerkats, Rats and Large Beetles. However, the Death Flower is a combination of many various Poisonous Algae rolled into one shape so it appears like a giant trap. Also it doesn't float, it's made of mud & partly touches the bottom of the Sea Coral floor. I surmise PI landed on this terrifying Island, imagined it the way he wished to see it and imagined it also floated in the water with an eerie glow. I believe some force "sent" him to this Island (which is hard to chart, but today's ships can easily visit the remains of this Atoll Island) in order to teach him a valuable lesson: There is no such thing as the Tree of everlasting perfection. The Life he thought he was nourishing was not his own, as he was in the middle of a dangerous place, Death Island, which is quite a few kilometers NORTH of Mexico. At night it got easier for the carnivorous Algae to attack him, the Tiger and those Meerkats. They thought they were entering paradise but awoke to the reality it was a giant Cave, one that rots with the real taste of death. That would explain all the Algae on his boat, the Meerkat bones, and evidence he carries but also explain how he exaggerated this aspect of his journey in LUMINOUS detail - by making the viewer wish to believe it was a glowing phosphorous, perfect paradise. And in that, lies a valuable lesson for us all. You can learn more about El Banoor's tainted world in National Geographic magazine & plant documentaries. I interpretted the island as "existence without hope/faith in salvation". Eventually the acceptance of existentialism would lead to nihilism and a loss of the human spirit. dpfortin - I like your interpretation of the island. Vivian - I just came back from the movie and you nailed it. I love your review Laura. Statements from the author and major theme of the movie revise myself why I awed to the story. Eventually, I only watched the movie. The picture is lengthy and 2 hrs. in 3D strains the eye. Picture is no good. As regards the interpretations, this novel and as such the picture is like a modern art painting where the viewers imagine lot of things and attribute them to the painting just because it is not 'fathomable'. The name 'Pi' itself is very symbolic as it signifies non-sense yet useful, unending and so on. Don't see the picture - as it is world is confusing. I was just thinking that the island is the building where certain religions put god. And that you could stay and ave everything you need but you won't experience life as it meant to be. Sounds like the old unreliable narrator. That kind of story can be a lot of fun. From the very onset of the story of "The Life of Pi, Pi was a seeker after the Truth. This awareness of Something to be known, dis-covered or understood is most often first felt around the age of 12 when still a child. The tiger was Pi's finite self. Finite means 'earthly' or nature-self - everything pertaining to human/animal nature. The tiger wasn't to be despised for its unruliness - its natural self, but it had to be overcome, tamed and brought to heel. It wasn't 'wrong'. The battle Pi had with the tiger is the battle we all have with our ownself (ego.) Stories abound the world over in myriad forms telling of this inner battle which can manifest as fierce as any tiger. "Other people" are there for our benefit - likewise the fearsome tiger, playing a part by creating necessary opposition, literally, so that we may learn about ourselves. The island which lived off itself, consuming itself - giving and then taking away, was symbolic of this world we find ourselves in. Humanity was depicted by the Meercats. This world is like a monster demanding to be continually fed and never satisfied. (Food, clothing, transport and housing!) The question is - to what end? When the island was seen for what it was, Pi had to leave taking the tiger with him, even if it meant drifting back into no-man's land out to sea. BUT, he had found the "Tooth" - the Wisdom Tooth? Some call it the Golden Fleece, some the Pearl of Great Price. This natural world, like thee tiger, is not to be derided - it provides us with the indispensible experiences we need and is the only place we can find "The Tooth. When Pi was no longer taken in by the illusion of the island/world - (he was in it but not of it), he was still partnered by his finite self, the tiger. His Spiritual experience was not yet complete. Pi loved the tiger with all his heart - it's our own Inner Self (God) thaty loves us as Pi loved the tiger. After much trial, error and so-called suffering (which is this life). the two eventually became One and at peace, ie, the Inner man and the outer man. Hitting rock bottom comes into the equation of necessity, as with Pi and the tiger when they nearly died. (It's when we hit rock bottom we become more receptive to the Truth. When everything is cruising along nicely we don't give it a thought. 9Note how automatically we call out "
There are vaarious ways of describing the conclusion. In the story, the tiger returned to its natural territory or put another way, the finite self, ie, the body and the personality (mask) that went with it, returns to the dust from whence it came in the first place. The tiger was very visibly worn out and thin. The finite self is worn out in the end. Pi, the Infinite Self - who we really are, returns to 'everlasting Life.' This is our Immortal Self which we have forgotten. This life is like a passing dream, an illusion - it comes and it goes. Anything that causes us to stop in our tracks - to wake up - to dig a little deeper below the surface of the passing scene - (don't take the passing scene for Reality), is to be welcome. There is a Good Reason why we are here having this experience. We can choose to get serious about it (like Pi) or we can play truant and put off the Quest, but sooner or later we will be hounded back to the classroom of Life. We will graduate in the end because we will eventually choose to. PART TWO: 'I saw God', the theme of the movie, means I saw mySelf, via and through the tiger. The tiger (the finite/animal self) was an instrument for this purpose - like a compost heap of dung is used to nourish a plant. We are here to feed and nourish ourSelf (God), our Inner Partner. "God needs us as much as we need Him" they tell us - we are not separate. Our own life is our own personal mythological story (you experience mythology) and as with mythology, it is not meant to be taken at face value- (and can certainly feel over-the-top at times!) Mythology is symbolic but because of misunderstanding, it has often been tampered with and turned into historical fact, all of which has compounded and confounded any translation. Pi's tears of pain at the end were over the death/disappearance of his finite self. It is the final letting go we all have to go through. From the Infinite point of view, nothing is lost, but from the finite it is a disaster. "When the heart weeps for what it has lost, the Spirit laughs for what it has found." We are eased into the letting go by first having to let go our childhood home, our parents, then our loves, followed by pour children and anything else in-between that we cling to, but in the end we have to let go that which we thought was our ownself. There is 'life after death' however. Once Realised we dis-cover/un-cover who we really are and we find we are one and same - equal partners with God, our Self.The foregoing, should it be considered, is an indication of the complete 'make over' our thoughts have to undergo in the final analysis. life itself is symbolic, symbolic of what? - that is the question. Seek and you will find - just lide Pi. In the end Pi had to make up a story for the masses (just as has been done to certain myths.) to make it believable. However, the mythical story is the 'true' story, that is to say it is the nearest it can bew to the Truth being put into words because Light Itself cannot be clothed (with words.) Myth can be likened to a good photograph of the Truth. Thank you Mary-Joan for sharing such articulate and well considered comments. It is certainly a book and film that continues to inspire a great deal of thought and debate - always a good thing, especially when it comes to the nature of the world and how we view it. 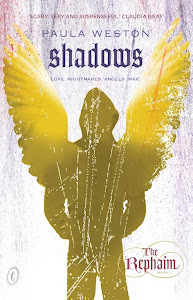 Young adult fiction - how do you define it?